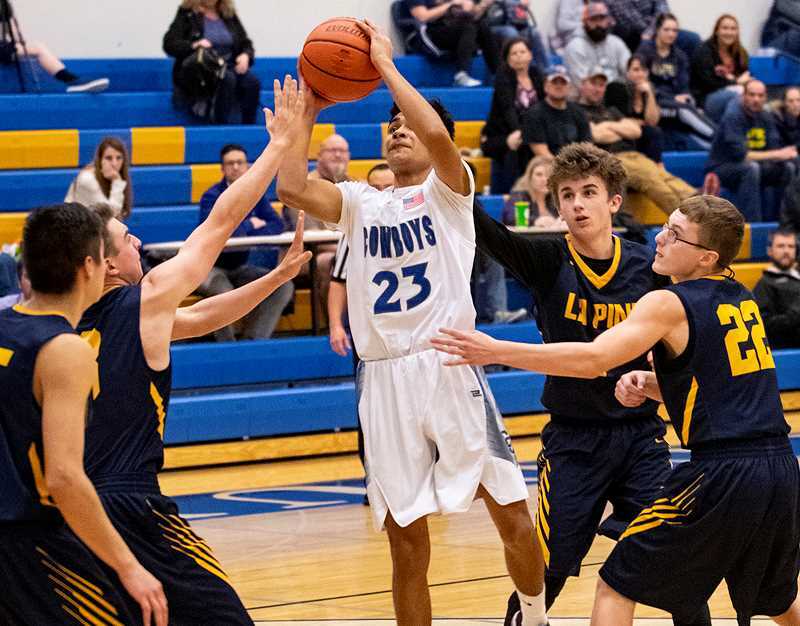 It wasn't their best game of the year, but the Crook County Cowboys still played well enough to defeat the La Pine Hawks 53-42 Tuesday night in Prineville. "We held them to just 27 points from the floor," Crook County head coach Darin Kessi said. "Obviously, if you can hold a team to 27 points, that's solid defense. The problem is we weren't as disciplined as we needed to be, and we fouled a lot. We sent them to the line 22 times, and they made 15 points on the foul line." The win improved the Cowboy's record to 4-1 on the year, their best start in more than a decade. It was the first home game of the season for the Cowboys, who were on fire early in the contest. Three pointers by Thaiden Mullan and Shane Kessi gave Crook County a 6-0 lead less than a minute into the contest. However, Crook County struggled to be consistent offensively the entire contest and had difficulty scoring in big stretches during the game. When La Pine's Alex Farnsworth hit a short jumper late in the first period, the Hawks were back to within two at 12-10. Tyler Humeston came off the bench to score four points in the quarter, including a bucket with just seconds left to increase the Cowboy lead to 14-10. "We fought hard," Humeston said. "After getting blown out our last game, it felt good to fight back and get a victory." However, as seemed to happen all game, Crook County committed a foul and the Hawks converted on one of two free throws to close to within 14-11 at the end of the period. The second quarter was more of the same as the Cowboys would extend their lead, then the Hawks would fight their way back into the game. After Kessi made his second three-pointer of the game, the Cowboys led 17-11. However, after a Crook County turnover and foul, the Hawks were back to within three points at 21-18. A late surge gave the Cowboys a 26-20 halftime lead. From that point on, Crook County continued to slowly extend their lead. The Cowboys outscored the Hawks 12-7 in the third quarter to take a 38-27 lead. When Jesse Sanchez was fouled and made both free throws, following a Cayden Lowenbach offensive rebound, Crook County had their largest lead of the game at 43-30. "I thought that there were times when we were really good offensively and we made the extra passes," coach Kessi said. "And there were times offensively when it got a little sticky and the extra pass was there and we didn't make it." The Cowboys were unable to keep the momentum going but were able to hold on to enough of a lead that they were able to play their entire bench late in the game. 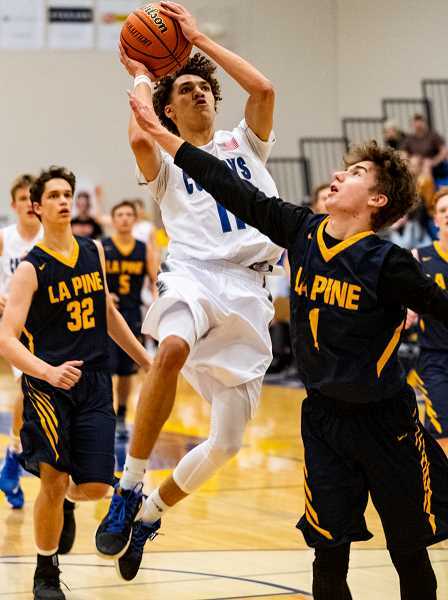 Lowenbach came off the bench to lead Crook County in scoring with 12 points, while Mullan finished with nine and Kessi with eight. Hunter Bishop added five points, while Kevin Sanchez and Humeston each had four. All told, 11 of 12 Crook County players who played scored in the game. Farnsworth and Triton Notary led the Hawks in scoring with 11 and 12 points, respectively. The Cowboys have been relying on three-point shooting for much of their offense this year. However, Tuesday against La Pine, Crook County struggled from long range, going just 6-25 from behind the arc. "We shot too many threes, but the guys have been shooting a little better, too," coach Kessi said. "I think that we were forcing a few things at times. We are a good shooting team, and I felt like we just were a little tight. I told the boys it feels like there is a little bit of a dam in the way right now, and that dam is eventually going to break, and we are going to really have one of those outpourings and show what we really can do offensively." Kessi was quick to point out that the Cowboys still haven't played as well as they are capable of so far this year. Still, the team has a lot of momentum heading into the three-day Marshfield Holiday Classic, which started Thursday. The Cowboys played La Salle Prep (1-1) Thursday night in the tournament's opening round. "We have to get back to the defensive mindset that we had against Sisters (the Cowboys' opening game of the year)," coach Kessi said. "We were really solid and that fueled us offensively, so I think we need to have that kind of mindset in practice heading into Marshfield. La Salle Prep will be a good test, but I think the boys will be ready and they will respond." Thursday's game was just the beginning of a brutal couple of weeks for the Cowboys. The Marshfield tournament features many of the top Class 4A teams in the state. Once that is over, the Cowboys have an even bigger task the following week when they travel to Salem for the Capital City Classic. That tournament not only features some of the top teams in Oregon regardless of classification, it also has some of the top teams on the entire West Coast. 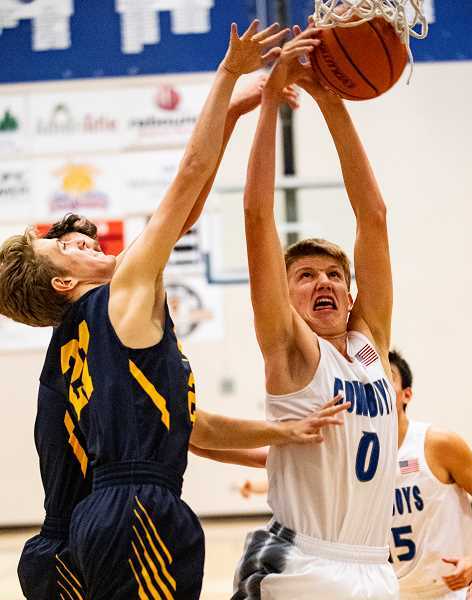 The four-day Capital City Classic begins on Tuesday, Dec. 18 when the Cowboys take on Wilsonville (3-0) in a 6:30 p.m. game at Willamette University. "We know what we are capable of," Kessi said. "We have seen some really positive glimpses, and I think that we are just working toward becoming more consistent. We recognize that we have a high ceiling. It would be nice to be playing a little bit better right now, but it's also nice to know that we aren't playing our best right now and we are still 4-1. The boys are going to work hard. They are committed to getting better, and we are going to continue to progress and improve, and that's something that I know they are going to deliver on." La Pine — Triton Notary 12, Farnsworth 11, McKittrick 7, Rode 3, Plant 3, Guilien 3, Bogart 2, Turnsplenty 1, Pinckney, Brown, Matthews. Totals: 10 15-22 42. Crook County — Cayden Lowenbach 12, Mullan 9, Kessi 8, Bishop 5, K. Sanchez 4, Humeston 4, J. Sanchez 3, Graydon 3, Savage 2, Ramirez 2, Langley 1, Chaney. Totals: 16 10-20 53. Three-point goals — La Pine: Farnsworth 2, Rohde, Plant, Bogart. Crook County: Lowenbach 2, Kessi 2, Mullan 2.